With autumn on it's way and cosy evenings ahead, I'm building up my candle arsenal already. There's something about a gorgeous smelling candle that really helps me relax. This year I'm going to try out some new scents and candles rather than stay in my Fig and Mimosa comfort zone. 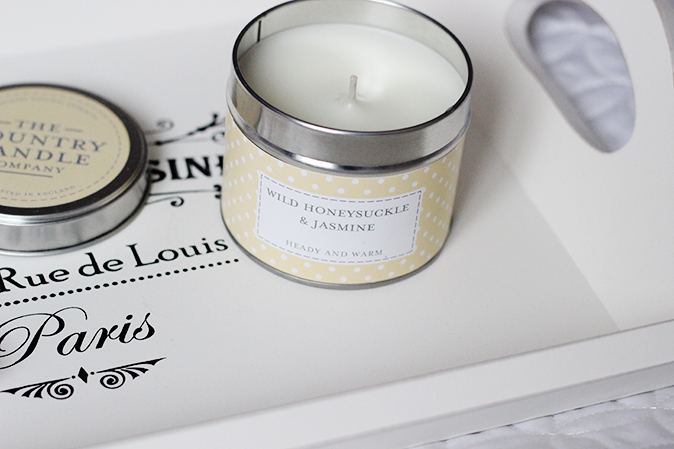 I'm currently burning this really cute Wild Honeysuckle & Jasmine* candle from the Country Candle Company. It's from their Polka Dot collection, and, as the name suggests, it comes in a polka dot tin that's really pretty. There's lots of other fragrances and different coloured tins in the range that would look so lovely dotted (sorry! ), around the house. The Country Candle Company are proud of their English roots and hand-blend and pour their candles in their own factory in Wiltshire, so you know they're made with love and not mass produced. I love the smell of this candle, its a beautiful heady, floral fragrance that is somewhat addictive due to the Jasmine notes. It's quite a warm smell as well and it creates such a cosy atmosphere to the room. At £8.50 a candle, this doesn't break the bank and provides around 30 hours burn time. It burns nice and evenly which is what you want in a good candle, and the fragrance really fills the room without being overbearing. 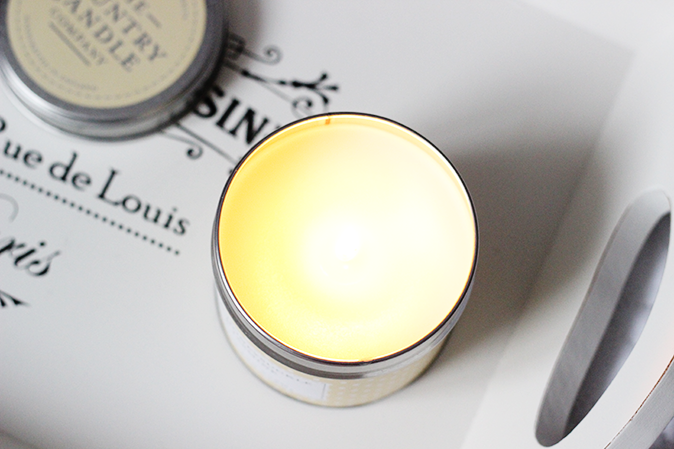 I love tin candles as when you're not using them they still look really nice and they don't collect dust which then smells horrid when you burn the candle. They also sell alphabet votive candles and I'm thinking that they would look so good at our wedding reception in October, spelling out our names, and maybe the date. What do you think?